As an AH-64 armament/electrical/avionic systems repairer, you will maintain twin-engine attack helicopters. The Army MOS for this job is 15Y. It is an entry-level job open to enlisted, active-duty personnel. The AH-64 Apache helicopter is a four-bladed aircraft with a two-person cockpit. As the job title suggests, MOS 15Y is responsible for diagnosing, repairing, and troubleshooting any issues with the AH-64. This includes preventive maintenance, ensuring weapons systems and other electronics are functioning properly, and keeping timely records of repairs and safety checks. This Army job is geared toward soldiers who have skills in mathematics, enjoy working with electricity, and using hand and power tools. You'll use your problem-solving abilities while maintaining helicopter systems. Your duties will include detecting and repairing malfunctions in the helicopter's systems and components, which include mechanical and electronic elements. These include the weapons and sighting systems, fire control units, stabilization systems, avionics, and controlled cryptographic equipment. You'll perform ammunition loading/unloading in the weapon subsystems. While you won't be flying these helicopters, you'll be tasked with doing everything else to keep them in shape for Army pilots. 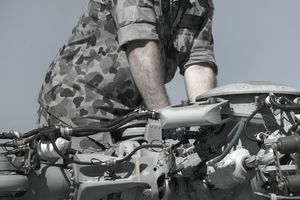 To qualify for this job, you'll need a score of 102 in the mechanical maintenance (MM) aptitude area of the Armed Services Vocational Aptitude Battery (ASVAB) tests, and a 98 in the electronics (EL) area. There is no Department of Defense security clearance required for this job, but you can't have a history of alcohol or drug abuse, including experimental use of marijuana after age 18. You can't have any history of using, selling or possessing controlled substances. You need to have normal color vision (meaning you can't be colorblind). With the skills you develop in MOS 15Y, you could pursue a career in the aviation industry maintaining helicopters and airplanes. You'll likely qualify for an array of jobs with commercial airlines and companies that manufacture or repair aircraft. These mechanical skills could also translate into other areas, such as car or truck repairs and maintenance. In short, if it has an engine, you can probably repair it once you've served as MOS 15Y. If you enlist as an AH-64D armament/electrical/avionic systems repairer, you will first go through the standard 10 weeks of Basic Combat Training (BCT; boot camp). Then you will take 24 weeks of Advanced Individual Training (AIT) that is specific for this job. You will learn about electrical systems, including the theory behind these systems and how to maintain them. You'll learn how to detect the sources of problems and find solutions. And if you don't already know how to, you'll learn to use a soldering iron. AIT for this job takes place at Fort Eustis, Virginia. As with all recruits, while you go through BCT and AIT, you will have limits on where you can travel and your schedule. Other Army jobs similar to MOS 15Y include 15S OH 8D Helicopter Repairer and 15N: Avionic Mechanic. Both are open to enlisted personnel. While 15S is restricted to active-duty personnel, 15N is open to both reserve and active-duty personnel.